Positive Grid released the awesome BIAS iOS app late last year. It’s been a hugely successful product for Positive Grid, but there was one issue. Users really wanted an iPhone version as well. San Diego, CA (February 20, 2014) — Three months ago, when Positive Grid (www.positivegrid.com) first unleashed its BIAS amplifier modeler and designer app for the iPad, guitarists and bassists around the world enjoyed it so much that they began clamoring for an even more portable iPhone-compatible version. Today, their requests have been answered with the official iTunes App Store launch of BIAS for iPhone. The new iPhone and iPod Touch version of BIAS features a number of sonic improvements over its initial iPad version debut, as well as the addition of ToneCloud, the industry’s first cloud-based amp sharing social platform. With BIAS for iPhone, users are able to create and share their own custom amp creations with fellow musicians as well as download, like and comment on the creations of others. But what truly makes BIAS for iPhone unique is that when perfect tones are achieved, users can upload them on ToneCloud and interact with other musicians, making it a social platform for great sounding amps. Guitarists and bassists will find in BIAS for iPhone an unlimited palette of tonal possibilities no matter what their musicals style are. Clean, glassy, blues, crunch, high gain, metal, bass and even acoustic amps can not only be selected, but customized to please the most demanding tone seeker. 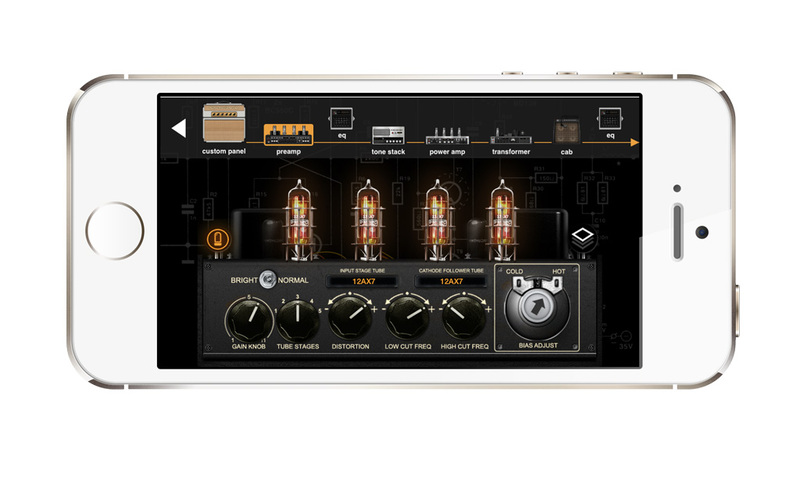 And for those looking to add realistic pedal effects to their custom amps, BIAS for iPhone can be seamlessly integrated with JamUp, Positive Grid’s powerhouse multi-effects processor, eight-track recorder and phrase sampler for guitar and bass. It can even be used with Apple GarageBand and a myriad of other audio apps using iOS7’s Inter-App Audio and Audiobus. • Fully customizable preamps, tone stacks, power amps, transformers, cabinets, panel controls and mic selection and placement—mix and match! BIAS retails for $9.99 and is immediately available for download at the iTunes App Store. Designed for iOS7, the app requires an iPod Touch 5 or iPhone 4s – or newer – to operate. For more details, visitwww.postivegrid.com or follow the company via Twitter (@PositiveGrid) or Facebook (www.facebook.com/positivegrid).